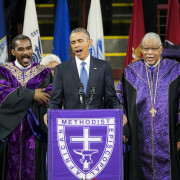 in June of 2012 in Nashville, Tennessee. 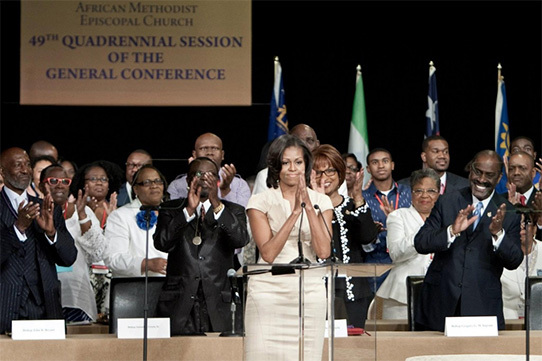 Mrs. Obama commended the AME Church and challenged the GC attendees to understand that the fight for civil rights has not been won. She went on to explain that all of us have to be responsible citizens, which means that we have to do our civic duties that includes being positive role models for our children. She encouraged the delegates and visitors to “continue the work, and bring others along with you,” and understand that Church is more than attending Sunday worship. 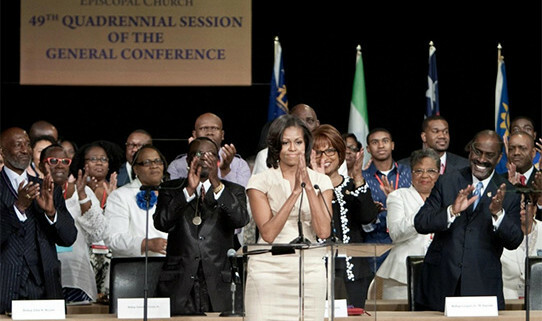 She went on to say, “Church is a 7-day activity.” Mrs. Obama encouraged church members to attend school board and other meetings and to integrate church programs with the programs of the local community. She also addressed relevant issues germane to the African American community, such as obesity, crime, political apathy, and education. She gave a rousing speech and received numerous standing ovations. At the end of her speech, she received a 5-minute standing ovation. She took time to meet and greet delegates and it was obvious that she had “connected” with the members of the conference.